In the wilderness, nature always lets the strongest survive and go forward. 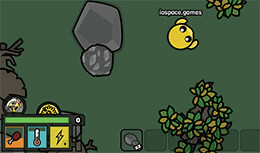 Think of yourself in a wild forest with hundreds of traps, enemies, and resources to use. You have to win the survival game, no matter what. Do you have the skills, the strategy, and the bravery to survive in the wild? Let’s find out on Devast.io. Here, you’re left all alone in the big wilderness. Your goal is to continuously grind resources, forge weapons and essential tools to become the fittest one to survive in the wild forest. Those who love polished, exciting and strategic games, Devast io is going to fulfill your needs pretty easily. The art style of the game is pretty simple. Yet, the graphics is quite polished. This games the game a nice look. Now, in the case of real gameplay, you have to focus more on yourself rather than the graphics. There are always enemies lurking all around, ready to jump on you at any moment. You have to keep on grinding all the resources possible, forge things and keep an overall healthy stats. Speaking of stats, you have to maintain your body temperature, your hunger and others in control. Otherwise, you may simply perish out of hunger/cold. The game comes up with pretty much the same controls as Fortnite. This game integrates all the real-life survival mechanisms with all the interactions possible with your surroundings. In a word, this game is amazing and exciting to play. At first, make sure that you get enough resource to start forging. The first and foremost important thing to forge is the campfire. There, you can cook your food for more energy or forge other additional tools. The second important thing to forge is the pickaxe. It will allow you faster grinding of the stones. For grabbing woods, use the hatchet. Now, when you’re grabbing foods, you have to use your hand. Otherwise, you’ll end up destroying the tree for some wood, nothing more. In your path, there’ll be plenty of fallen trees, so don’t worry about woods. Gathering resource is crucial. Keep on gathering all the necessary resources around yourself. Don’t forget to keep an eye on your water level, body temp and health. Keep on moving from place to place to find out a safe spot to stay hidden, collect resources and forge in peace. Forging can take time. Once you’ve crafted enough weapon, you can start dealing with the enemies floating around. Killing an enemy offers great value. Be careful about different poisonous, dangerous objects! You can also build your own fort for protection. Feel free to build your own once you’ve become strong enough to survive in the wilderness.